Applications for Embryology 2019 are due on February 1. In this post, I share how I learned about the Embryology course, what made me apply and what I brought back from it. That is how I met Dominique Bergmann, plant developmental biologist at Stanford University, as she was noticing the many names and embryos on the back of my 2018 Embryology Course t-shirt. «I can’t find mine anymore, but in my case that’s from many many years ago», she later added. 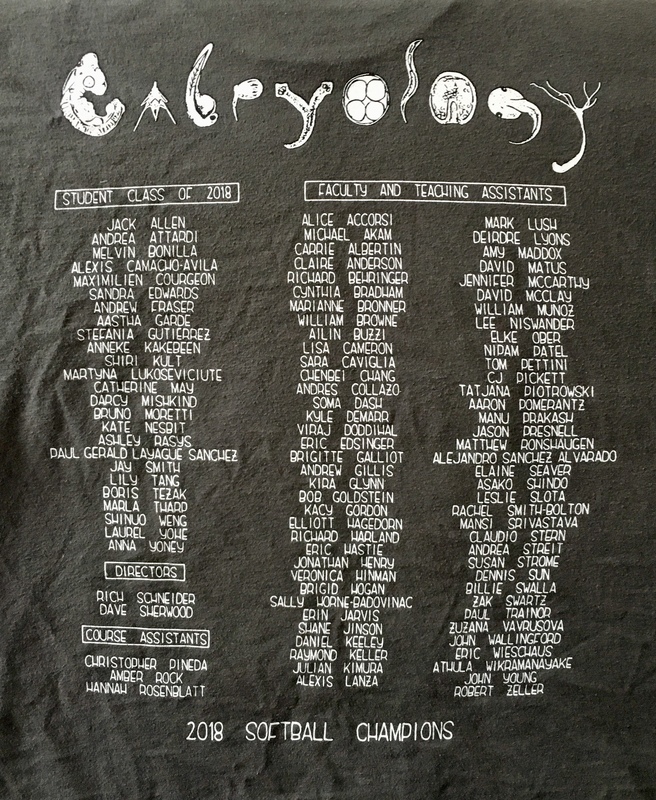 Back of the Embryology 2018 course t-shirt. The names of all people involved in the course are included. The font used has been generated off of Paul Gerald Sanchez’s own handwriting. Embryo drawings from Ashley Rasys. Despite of the years though, many people have been meticulously collecting those t-shirts. In fact, some of the scientists who I met this summer would have collections spanning decades. I remember Andres Collazo talking about how he strived to keep them in perfect conditions in order to showcase them every year, once back to the Marine Biological Laboratory for Embryology. I now understand why: each of those t-shirts tells multiple stories. Stories of science of course, but also of people who decided, that year, to spend six weeks sharing their passion for developmental biology. During my undergraduate years I was lucky enough to find this passion. I studied biotechnology at the University of Palermo, in my italian hometown. Among the many courses, I still remember very clearly the only developmental biology class, taught by Ida Albanese. There I heard for the first time about developmental biology’s questions and approaches. Ida’s lectures often had a historical perspective, blending the experimental elegance of classical embryology with the latest molecular and biophysical characterisation of embryonic events. I was hooked, simply amazed by the progression of intertwined processes through which diversity and complexity are generated from a single fertilised egg. At the end of the course Ida told us about Alberto Monroy, after whom our department was named. Monroy had a key role in shaping the field of developmental biology in southern Italy, having spent his career between Palermo, the Stazione Zoologica in Naples and the MBL. There he used to go every summer to conduct research and interact with the students. To honour him, the University and some private donors had established the A. Monroy Fellowship, which once a year funds the participation of an Italian student to the prestigious Embryology course. I googled it to see what the course was about. I said to myself, one day I’d like to be part of this. Four years later I had completed my masters degree and joined Jacqueline Tabler‘s lab for my PhD. That moment, the beginning of a new challenging project, would have been perfect to take the course. With the support of my supervisor, I applied. I was performing my first experiments in the lab when I got the results. I felt extremely happy to accept the scholarship and prepare for a summer in Woods Hole, looking forward to making it part of my story as well. When I first visited the Embryology course website, I was struck by some sentences on the application form. 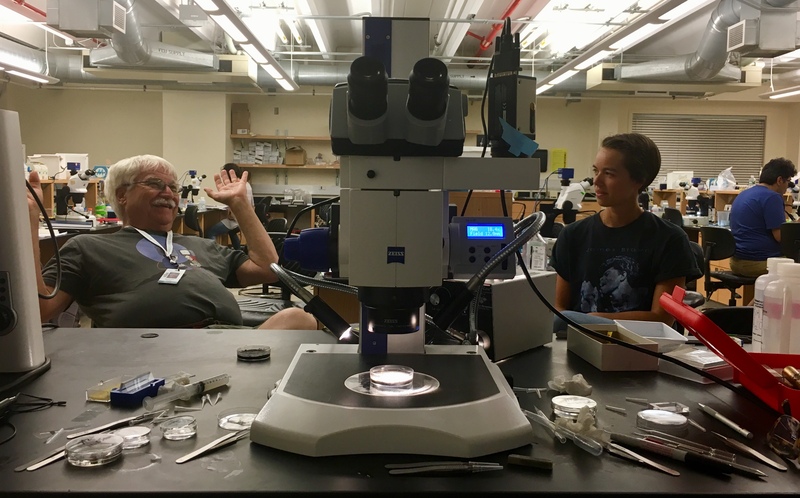 We would like to emphasize to applicants that MBL discovery courses are extremely rigorous […] There is little time for much else but course work. I wondered what a samurai training course for developmental biologists looked like, and feared that would have been exhausting. Such fear was unfounded. The first day of the course started with an introduction by the course directors, Dave Sherwood and Rich Schneider. They then suggested to start getting to know each other with a game. In front of the posters that we brought, each one of us had to talk about his own research to another student in the course. Afterwards, all back in the same break room, students would tell the entire class about the research of their fellow. Everybody’s enthusiasm for science filled the room in a way I had never witnessed before: we were all sharing what we truly loved about our projects. That was only the beginning of a six-weeks journey of scientific discovery, creativity and fun. We would learn about a new field and organism everyday by some of the world experts on those topics. We would then have intense but informal Q&A sessions with them, during which you had to ask something and could ask anything. Lab work was on in the afternoon. At the microscope, injecting and dissecting embryos, running reactions or just observing faculty and TAs performing their favourite experiments. We would be taught how to craft pipettes out of glass capillaries, in order to graft a tiny piece of tissue from an embryo to another. At a certain point of the night we would stop, as Paul Trainor put his forceps back into the drawer and started making amazing cocktails for us. Having fun in and out of the lab, trying new and crazy experiments, some of us even got authorship in a paper. That’s Woods Hole. One of my favourite pictures from Embryology 2018. It’s 1AM and we’re going through the Xenopus module. Ray Keller discusses life and science with Anneke after having taught her how to make a Keller explant. Melvin is at his bench, still working on an experiment. Under the scope, Xenopus embryos are performing gastrulation. Many say that taking the Embryology course changes the life of its students. In fact, right there some people found the research question or organism they would later base their career on. Others ended up meeting their future postdoc advisor among the faculty. I’ve also read of students who got rid of their fears thanks to the experiences made at Embryology. Personally, I think taking the Embryology course really changes your life, but in a more subtle way. For one summer, one hundred people with a deep interest in developmental biology meet up. All at different stages of their career, they represent the past, the present and the future of developmental biology. So many diverse expertises, experiences and personalities converge to that lab and those lecture rooms. Even if many of us work in different fields or in different parts of the globe, I’m sure the connections that we established will last long. I’m excited and curious to see the many unexpected paths they will put us on. You don’t take the Embryology course just to learn, you become part of a community of scientists in love with development. So, like Andres, I’ll make sure not to wear off my embryology t-shirt too much. And like Dominique, I’ll be looking out for people wearing those t-shirts with embryos on the front and embryologists on the back. The many stories and all the wonderful people I would have liked to mention are too many. I thank everybody who made #embryo2018 a fantastic experience. If you want to read more, please check the posts of my course-mates Aastha, Anneke, Martyna, Paul and Sandra. Also, head to the Embryology course website to have a look at the course galleries and read about its history.